Just like that, the promise of a brilliant career vanished with one very bad decision. The young superstar running back will (most likely) never gain another yard in the NFL. Despite his talent, no franchise in their right mind would take a chance on him, not at this point, not after another damning hotel video has been released showing Hunt in a compromising position, kicking a female in a hotel hallway. In the pantheon of modern sports tragedies, Hunt’s tale has to rank near the top of the list. Before we start talking about the Hunt incident, it bears noting that the real tragedy is that this sort of behavior continues to take place at all, in all walks of life, not just the NFL. 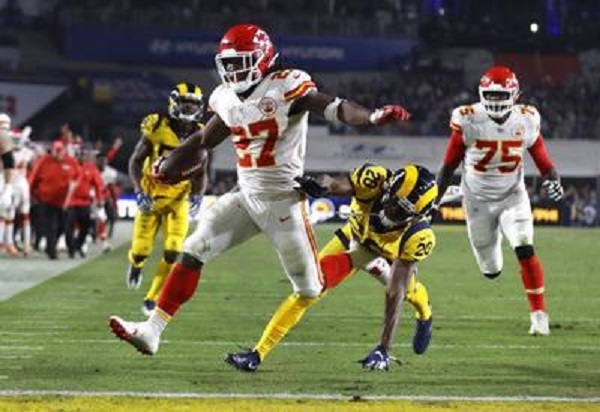 News broke of Kareem Hunt’s altercation with a defenseless female late Friday afternoon, although league authorities had been conducting an investigation since the incident occurred last February. Allegedly the NFL and the Kansas City Chiefs both knew something was amiss, even that a video existed, which once again begs the question what did the league know, what did the team know and why does TMZ continue to out-scoop the NFL when it comes to its own self-policing? The Chiefs’ story is that Hunt was not forthcoming about details of the incident. The team was also not allowed to interfere with a league investigation. Once the team got wind of the video’s explicit nature, Hunt was immediately released. Perhaps the NFL should consider employing TMZ’s investigative staff in an effort to be more thorough. You’ve all seen the video by now and if you haven’t, you can Google it for I’m not going to post it here. It’s not as disturbing as the Ray Rice footage TMZ leaked years ago (another video the NFL claimed it didn’t know about, a video that for all intents and purposes ended Ray Rice’s career) but it’s not good, that’s for certain. The Hunt debacle is the last thing the NFL wanted right now. The season was going famously well. We had finally put all the anthem talk to bed. We had fresh young teams, Chiefs included, charging towards the playoffs and challenging the status quo. Hunt was a huge piece to one of those young teams, a team that any NFL fan would tell you was only a matter of time before they won it all. Anyone who watched Hunt recognized he was a different breed of athlete. The 23-year old was only in his second season. He fit perfectly into a freakishly, athletic Kansas City team that seemed poised to create a dynasty: phenom quarterback, star running back, speedy wide receiver, a tight end emerging as the best in the league and a veteran coach who helped blend all these pieces together. Hunt was only beginning to make his mark on the league. Last season, he finished second in voting for Offensive Rookie of the Year Honors to New Orleans’ Alvin Kamara. Only weeks ago, we were talking about Hunt and his Chiefs playing in the most exciting Monday night game ever, a 54-51 thriller that had every fan riveted. Hunt had only begun to make his fortune. He made just shy of $800,000 this year but that would pale in comparison to the deal he would sign when his initial contract lapsed two seasons from now. In the world of ever-increasing NFL salaries, Hunt was poised to easily make fifteen times that amount. That turns out to be money pissed away, a living Hunt will never see again. 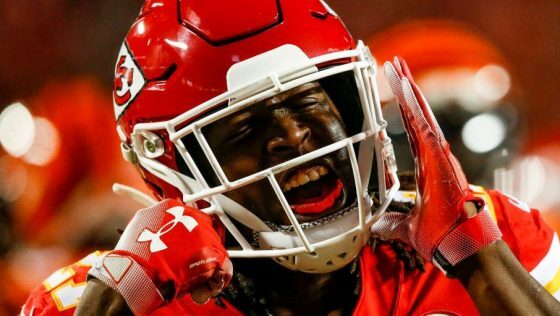 One fateful February night, Kareem Hunt made a mistake that probably cost him around $100 million. The Hunt news was upsetting to any fan of the league and any fan of human decency for that matter. Reports from within the Chiefs clubhouse said it felt like a funeral as a crying, remorseful Hunt left the grounds to face the repercussions of his actions head on and perhaps alone. No one can excuse kicking a defenseless woman yet that’s what Hunt did, right on camera for everyone to see and for TMZ to find. It’s for what he’ll always be remembered. I’m not quite sure what possesses men to act like this but I understand these actions have consequences. Now Hunt does too. I’m pretty sure he’s not sleeping well these days. The NFL will go on, Hunt’s case just another sad story. It’s upsetting that this sort of behavior continues to happen. What is also upsetting is that sports fans don’t get to see a young man live up to his true potential, at least not on the field. Hunt was unable to differentiate between right and wrong that night. Maybe Hunt will realize his life has another calling for it’s not going to be in the NFL, at least not any time soon. There are no winners here. Not Hunt, not the victim, not the league, not the Chiefs, not the fans. So, we move on with the games until the next unfortunate incident. Here’s hoping it’s a while before we have to watch another one of those surveillance videos. Flags will be flying at half-mast this weekend for the passing of former president George Bush. They might as well be in remembrance of what would have been Kareem Hunt’s formidable career. This entry was posted in Featured, Pigskin and tagged Andy Reid, Kansas City Chiefs, Kareem Hunt, NFL, TMZ by Chris Humpherys. Bookmark the permalink. Is it true that he kneeled during the national anthem to protest police brutality? How ironic. The symbolic knee he took gainst violence didn’t roll over into his personal actions? ….That’s weird. Sad that NFL defenses couldn’t bring him down, but a THOT could. Stupid is as stupid does. Probably toast, but wouldn’t it be scary if the Patriots picked him up? Yesterday I was at the casino at the video poker bar when a story about him aired on the TV. The guy sitting next to me said, “We should pick him up.”. I argued that it would be a terrible idea, he countered that the Steelers have already hired a dog torturer. I then said that Vick was a mistake, no reason to double down on bad judgement. His last reply was that the Patriots will probably pick him up. Sadly, that would not surprise me. He should have played for Urban Meyer – he would have fit right in. What’s worse, Daybreak, is that the majority of people polled think he’ll be in the league again. Read the comment right below yours. You’re not the only one to recognize the irony. Speaking of bad tempers, I’m having dinner with Steve the Beave this Wednesday/Thursday night as he comes to Tampa. I wonder what’s the standard heat desensitizer in cases like this. One week? One season? After one full season, will we have forgiven a contrite Hunt, allowing him back into the league and passing through the court of public opinion? His agent has his work cut out for him. And any word from the league on this? Or is his team cutting him and no other team touching him punishment enough? Ironically, you’re not the only one to suggest the thing about the Pats either. Whoever lands him will have plenty of spinning to do, that’s for sure. Maybe when Urban Meyer takes an NFL gig, Hunt’s will be the first phone call he makes.